Relax to the sound of crashing waves and take in stunning panoramic views of the Pacific Ocean from this spacious, one-bedroom unit charmingly decorated by its owners. You’ll love the super comfortable king-size bed, HDTV, DVD player, fully equipped kitchen, dishwasher, washer and dryer. 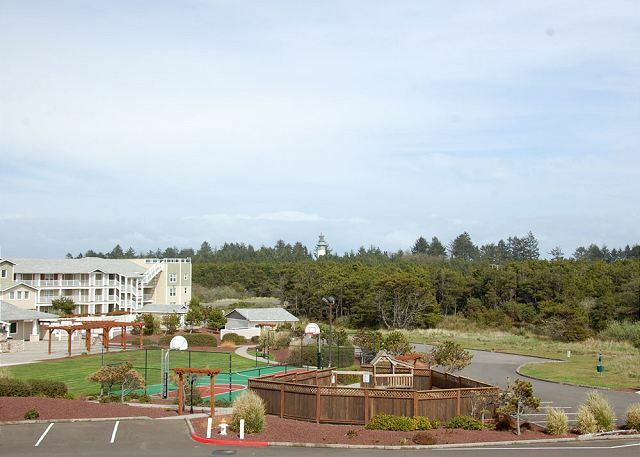 Add in all the amenities the complex has to offer: Easy access to 12 miles of beach — a treasure trove for agate and shell collectors — a mile-long concrete pathway along the waterfront to the finest surfing beach on the Washington coast, a seasonal swimming pool, hot tub, exercise room, barbeque grills, putting green, basketball court, children’s playground, high-speed internet access and a clubhouse with a library and you will soon discover that it’s the ideal way to escape from the daily round of a busy life, to enjoy a romantic getaway, or to take in a fun vacation with the kids. You’ll wonder why it took you so long to discover the best vacation spot on the Washington coast. Great condo. Nice view, well stocked. Dishwasher so-so. Stove/oven controls lettering illegible. Thanks for staying and we appreciate you letting us know about the stove control being hard to read. We've ordered a new replacement panel to make things much more legible! This condo has beautiful views, very clean and quiet beaches...loved it! We had a wonderful time at this Westport Condo. Our unit was clean and everything provided was appreciated. However, there were a few minor maintenance issues. The toilet lever wasn't functioning and needs to be replaced,a leak in the kitchen faucet needs fixed, the coffee pot basket is in pieces. Just needs a little attention. Thanks for staying and we're thrilled to hear you enjoyed the condo. We appreciate you letting us know about the minor maintenance issues so we can take care of them right away. See you again soon. Very much enjoyed the stay here, most certainly would recommend it! Been coming to VBTS for over 15 years now and love it every time I open the door to a condo. I know it will be clean and well stocked with all the necessities we will need. Grab a few groceries up at the small store on the corner and we're good to go. Thanks for being such a loyal and regular customer, we really love hearing we continue to meet your expectations year after year. See you again next year. This was our fourth time staying at Westport by the Sea. It's in a fabulous location, close enough to everything and right on the beach. Each unit is nice, well-furnished and well-stocked. The hot tub, pool, outdoor grills, outdoor seating and kids play area make it a hit for our whole family. it was a very relaxing time & we enjoyed being there. Lovely time, except the one of the units above or beside was noisy with furniture movement. Wonderful complex and beach. Well equipped. Please note though the fold out bed was broken and we had to pull the mattress off and sleep on living room floor. I did report it so hopeful it is fixed. Would like to stay again sometime. Because of a schedule conflict we had to rethink our vacation this summer. We called Vacations by the Sea and were able to secure a very nice vacation rental in Westport, WA. We were even given a discount for a "last minute" rental. It was "as advertised" in every way. Closer to the beach than expected... and close to grocery shopping, a great coffee house and plenty of places to eat out. We will definitely be back! We had a great time. The view from this condo is excellent. ..it nice to be able to open the windows and door and be able to hear the waves crashing. The condo had everything you need and was very clean. Multiple friend milestone Birthday celebration vacation at the Washington Coast. The condo we stayed at was 323. It was a one bedroom with a view across the sand dunes towards the ocean. Our friends stayed in Building 8 which was very close to the ocean. They had 2 bedroom condos. All of our condos were well equipped and clean and in good repair for the most part. We liked the pool and clubhouse amenities and appreciated being able to reserve the barbecue area to celebrate the birthdays and grill our dinner. There is an asphalt trail from Vacation By the Sea that goes all the way into Westport. The only thing I would have wished for is beach chairs and pool towels, neither were provided. Thanks for staying and sorry to hear you didn't find the pool towels provided in each of our condos, they are located in the cabinet in the bathroom. If you ever find you need something please let us know and we'll be happy to help. Exceptionally clean and well maintained. Spectacular view. Enjoyed the easy access to the beach. Looking forward to our next visit to Westport and Vacations by the Sea. I was very impressed with this unit. The décor was perfect. It had everything we needed. It was a wonderful stay and we will return again. Thank you! We had a lovely unit with a wonderful view. Spent lots of time by the pool with the grandkids. We had such an amazing weekend in the condos! Everything was there that we would have found in a high end hotel-- and more! Definitely staying again!!! I love the condos. It's a little noisey being on the 2nd floor with dogs above you but overall it was great. We had a wonderful stay in the condo, it was clean, well equipped and we would highly recommend this place to everyone! The entire process from reservation to check out was very smooth. The condo was very comfortable and well outfitted. The view could not have been better. We loved watching and listening to the surf as the wind blew the rain sideways the entire weekend. We slept in, read, ate, watched TV and took naps. It was perfect! Thanks for the late checkout to watch the Seahawks game. Very smooth process, highest recommendation. Check in at 4 saturday, checkout at 11 Sunday. For this short stay the price was a bit steep but it was nice to have a comfortable and tidy room. The view is stunning but we only got to enjoy it for 20 minutes on Saturday night due to the late check in. Sunday management said for $50 more we could have 2 more hours and check out at 1. We chose to leave early and get a $5 credit on bill. I am happy to pay a reasonable rates but felt the check in and check out during the off season could have been adjusted so you can enjoy what you pay for with a ocean front unit. The view. Other than that this unit really deliveref and was larger than expected. The kitchen had what we needed to cook breakfast, enough towels for 3 people, there was a missing a hair dryer but the bathrooms were very clean. You take out your own garbage so we planned ahead. There was no walking access to the beach due to a winter storm but it was only a short drive to another beach. The recommendation for Aloha Alabama for dinner was so great we went there for lunch too. Thanks for staying and we're glad to hear you enjoyed the condo. Our check-in time of 4pm is a guaranteed check-in but we do our best to get the condo ready earlier for guests. Please give us a call on the morning of your arrival and we can give you a better idea of when the condo will be ready. A late checkout of noon is available if no other guests are arriving if you call us the morning of your departure to check. Beach access can be challenging during the winter but the sand slopes back for easier access in the spring and summer months. Hope to see you again in the future. We had an amazing experience and hope to return in the next couple of months. The weather was stormy and wet, but we were snug and comfy in our waterfront haven. Thank you so much. Nice place and location. Very relaxing. Our overall experience was excellent. Clean unit, great location, no pets, non-smoking, well-equipped kitchen, etc. However, the owner's extremely soft bed, for us, was very uncomfortable. It would be very helpful if the beds in the various units could be rated: firm, medium, or soft, for prospective renters before they choose a unit. We had kind of a freak weather condition. Knocked out power all day Saturday. Thanks for staying and the power outage was most of out of the ordinary for August. We haven't actually lost power for more than a few minutes since 2007, but we hope you made the most of it and enjoyed watching the storm from the condo. Always happy with the accommodations and how easy it is to book. Even in the middle of summer it's peaceful and quiet. Loved our stay for our 38th wedding anniversary. Great view and quiet. We will certainly book at this resort again now that we know it's there. Thanks so much. What a gem! Stayed along the Oregon Coast before we found this place. This was by far our favorite beach rental and we can't wait to come back! I was very happy with the condo. It was exceptionally clean and was well-stocked with everything we needed. While this was my first stay in this unit, I've been to Vacations by the Sea several times. The facilities are perfect for my family - the little ones love the playset and we always use the basketball court and large patio with BBQ grills. And of course, the pool is a big plus! We arrived at our room between activities, and we're delighted with the location, view, and appearance of the condo. This was our second time staying there and it was just as relaxing as the first time. This is our second trip to Vacations by the Sea. What a lovely place to visit. 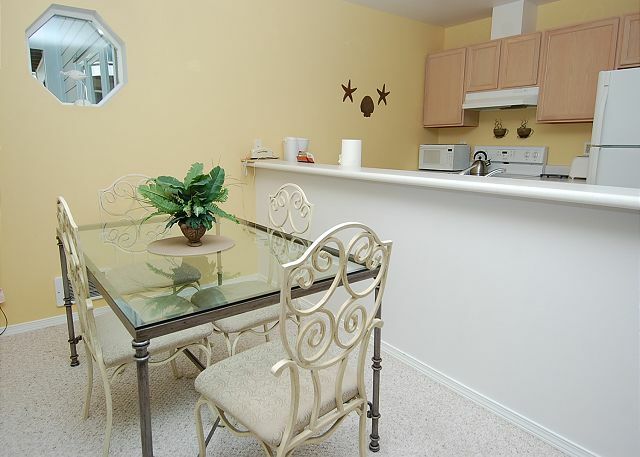 Both times, our condo has been incredibly clean and fully stocked. We had excellent views of the ocean, and even better sunsets to gaze upon from the deck. Great books, movies, and games were available in the lodge. However, the town needs a grocery store! A very nice 2nd floor and comfortable unit with a great view. A few steps from the beach. Everything was in top shape and well supplied for cooking. Note if you have difficulty walking the stairs that the building has no elevator. Wonderful to hear you had a great stay with us. Condos in buildings 1,2,3, & 4 do not have an elevator to the upper floors, but there is an elevator in all other buildings on property. Thanks again and hope to see you again soon. Nice Beach and good amenities are available at the resort. Nothing special about Westport town. Bring your supplies and groceries before coming. Unit 323 had a great view of the ocean. You can't see the beach from it because if the grassy hills protecting the beach from erosion, but you see the surf. It's right by the beach so doesn't take more than a minute to get out to walk in the sand looking for pretty rocks and shells. We bought seafood in the marina (5min drive away) and cooked at the condo, which has all the kitchen amenities necessary. This was a great place to go with a 1year old for a few days. My wife and I spent two nights. Condo 323 was very nicely appointed and was furnished with everything we needed to make our stay a relaxing one. The view of the ocean from this second-floor room was great; it was the icing on the cake. The king size bed was very comfortable and the condo was spotless. One of the remotes was missing one of its AAA batteries, but I was able to work around that problem. I do feel that the $50 cleaning fee, especially for such a short stay with only two people, was a bit excessive....especially when you require that we gather up and haul the garbage out to the dumpster before we leave. Great place to sit and watch storm. Our family rented several units and we were delighted at the total choice. We'd do it again. We immediately felt right at home in our unit. It was well furnished, well supplied, warm and cozy with a magnificant view. Access to the ocean and beach were convenient. The total complex was neat and clean. Nice location. Clean place. I took the family but just about anyone would enjoy a stay here. What a wonderful place! We will be back next year for sure. Clean, comfortable, amazing view, beach and pool close by, very friendly staff. We loved it! My family thoroughly enjoyed our stay. It was just what we needed to get away from our very busy schedule. We'll be back soon! Thanks for staying at Vacations by the Sea! I would highly recomend this to everyone. Very Clean, quiet, great views, easy beach access for walking, condos have most everything you need. We stay 2 -3 times a year. Thank you for being a loyal customer and telling all your friends about Vacations by the Sea! See you next time. We had a great time and plan to come back again!!! I will be returning every year. Very nice spot and would recommend it to everyone I know. Thank you and we look forward to seein you again! We came to the beach to get way from it all. The Vacations by the Sea is just the place to do it. Out condo had everything we needed to just hang out and watch the ocean. We even walked to Westport on the Trail to eat dinner at the Half Moon Bay. Overall our stay was wonderful. We have stayed at this condo before and will return again. Just two items were not up to standard. Light bulbs are missing from fixtures or were not replaced. Also with the wind the construction area on the stairs was very noisy making it hard to sleep. Thank you for spending Thanksgiving weekend at Vacations by the Sea. If our inspection staff missed some lightbulbs, please call us next time, we'd want to make sure your stay is enjoyable and would come and replace them right away. We did have 2 unusual back-to-back windstorms, and we're sorry they disrupted your sleep. The building maintenance is unfortunately necessary to keep the property in the top conditiion our owners and guests expect and should by done by the end of December in this building. The place was very clean and in great condition. Was a lot bigger unit than I expected, with a great view off the balcony and easy access to the beach. Would defintiely come back! We're really happy the condo exceeded your expectations and you plan to return. Surfing has always been a big draw for the area and there is nothing like surfing all day and coming back to a nice condo such as 323 to relax afterwards. Sure beats hopping in your car and driving back to Seattle all damp! See you again soon. could not get wifi in our unit. I'm glad you had such a great stay and gave Vacations by the Sea such high marks. Please let us know next time you have a problem with the WIFI which is available in all our units and we would be happy to help you troubleshoot the issue. Hope to see you again soon! We're glad you had a great time at the condo and found it relaxing. The Ocean here in Westport can be very dynamic and changes so much depending on the weather. Many days I've walked on the beach to have the ocean be almost as flat as a lake while other times it rages with huge swells breaking on the shore. I'm glad you found a nice calm beach to enjoy the summer fun. Next time check out Half Moon Bay at the Westhaven State Park near the Marina. The water is usually very calm this time of year and parking is close by near the Coast Guard observation tower. What a beautiful place right on the ocean! Second stay as good as the first. Some side window and door shades in the main living space would be nice. No complaints what so ever. We found that everything was beyond our expectations! What a great alternative to a hotel. Thank you for staying at Vacations by the Sea! We booked the unit to celebrate the seventh birthday of our twins. We typically camp at Grayland, but due to a recent back injury, we needed more 'homey' accomodations. Having seen the complex while visiting the lighthouse, we thought it could be a good option. Our unit was fantastic in location, cleanliness, decor. We baked the kids birthday cakes while basking in the sun on the deck and watching the waves break. We enjoyed the hot tub. Loved the access to the bike trail leading into town. It's a great section of beach as the only vehicle traffic to worry about is the ranger and he's on the look out for people. All in all, an awesome weekend experience in a home away from home. Thank you! This property is located right on the ocean, within walking distance. It was a quiet and clean complex with lots of family friendly ammenities. Will be back soon! This is the second time we have stayed at this unit and find it most comfortable and convenient. The bed is the best! We were a little dismayed that construction was being done on the outside as it was noisy and distracting but we applaud the commitment to excellent upkeep of the property. Thank you for choosing Vacations by the Sea as your repeat vacation destination. I hope the sun comes out more often for your next stay with us! Don't forget, we have a honor library and movies to rent at the clubhouse in case you spend more time indoors than you would like. Thank you for the positive review, we hope to see you again soon! Property was clean and well equipped - good view and great location. We will be back (when it warms up a little). The unit was VERY large and had a lovely view. We had everything that we needed. I noticed the the unit was on the old side; also the heating system did not work quite right and overall the finishes were not modern, fancy, or up-to-date, but it met our needs for a fun place to stay for the weekend! Although the weather did not cooperate, we enjoyed our stay. We watched the storm move in from the quiet comfort of our condo. The balcony gave us a means to enjoy the sound of the surf without having to go out in the storm. Overall, it was a great getaway from the city. The property is spotless and amenities many. We will definitly return. Great place. Haven't been at that one before. Would definitely consider it again. Wendy S from Auburn, WA does not recommend this vacation rental. Beautiful resort, loved the heated pool!! Plan to come back. I was very impressed, especially all the amenities provided. We would definitely stay in this condo again. It is very well equipped, very clean, very spacious, with a beautiful view. Vacations by the Sea is a beautiful resort and is very clean and well taken care of. The clubhouse is a great place to hang out and the pool and hot tub too. We would have liked to have wifi in the condo itself and not have to go to the clubhouse for that. Too bad it was cloudy and cold when we were there in July because it felt like October! Not much in Westport; come for the resort! Most lodging options in Westport are limited to motels and RV parks. We tried this place and were not disappointed. It was right on the shore next to a state park with paths through the dunes to the beach. It's also adjacent to a paved walking/biking path that runs a couple miles the length of the shoreline and drops you right into town. That was great for an afternoon walk - safe, scenic, and no traffic to contend with. The condo was designed for convenience; it was clean and well-stocked with linens and other items. Having the washer and dryer right there in the unit was a definite plus. The kitchen was very nicely stocked with full size appliances and enabled us to prepare meals right there every night. Management was very responsive. There was also a heated pool, basketball court, and putting green, and you can borrow equipment for no charge. We didn't take advantage of that since we spent most of our time at the beach, but these amenities looked like they were in good shape. Overall, this place beat the pants off staying in a small motel room with a tiny fridge and microwave, far from the beach. It's pricier than motel rooms, but it wasn't extravagant and it was worth every single penny. We'll definitely be back for our next trip to Westport. Blinds on windows will make me more comfortable. we could not be happier-we stayed there in 2008 and were looking forward to coming back and we were not disappointed.